Hawaii Ocean Current Energy Resource Assessment | Sea Engineering, Inc.
Sea Engineering, Inc. was contracted by Hawaiian Electric Company, Inc. (HECO) to evaluate the ocean current resources around the main Hawaiian Islands and to determine whether or not the resource had the potential to be a significant source of renewable energy at present or in the future. The study had three primary objectives: as assessment of prevailing currents; an assessment of the present and future state of underwater turbine technology; and, an evaluation of the applicability of the technology to Hawaii. The resource evaluation included the main Hawaiian Islands out to a water depth of 2,000 meters. Because the existing information did not have sufficient geographic coverage on which to base a comprehensive assessment of nearshore currents, we used a state of the art circulation model developed by the University of Hawaii. 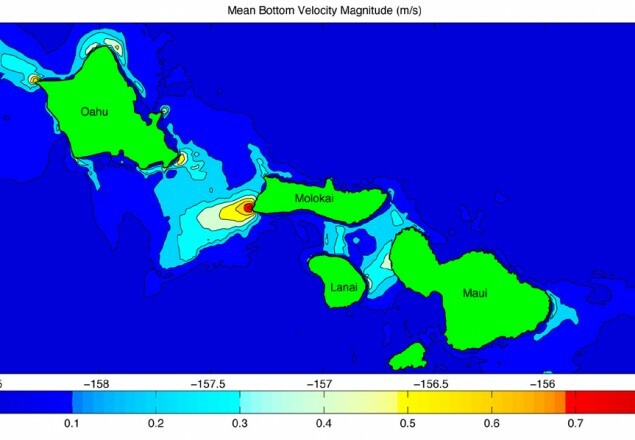 The model was modified and computer simulations were then run in sufficient quantity to allow representation of prevailing currents for all nearshore areas of the Hawaiian Islands. The simulations were the basis for the preparation of contour plots of the currents and power density in the study area.